Join us for an evening of community, story sharing, art and memories. Over a decade ago, a group of artists and activist got together with a dream of collectively owning a community center. In December of 2006, that dream found a physical home at 4 King Street. Our dream has slowly evolved with contributions from hundreds of people to create this space. 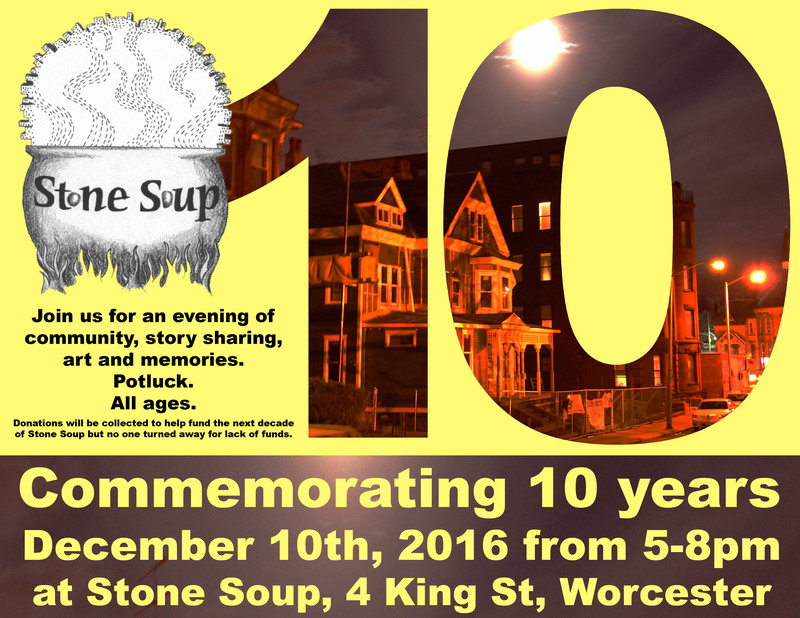 Come celebrate Stone Soup and share what this space and community has meant to you. This is a potluck – please bring something to share. Please spread the word in your group, with your friends, and to anyone who has been involved in Stone Soup over the years. Donations will be collected to help fund the next decade of Stone Soup but no one turned away for lack of funds.